I’m going to get some grief from some by calling this a paella. It’s not the paella that people think of with the beautiful prawns and mussels you’d find by the ocean. 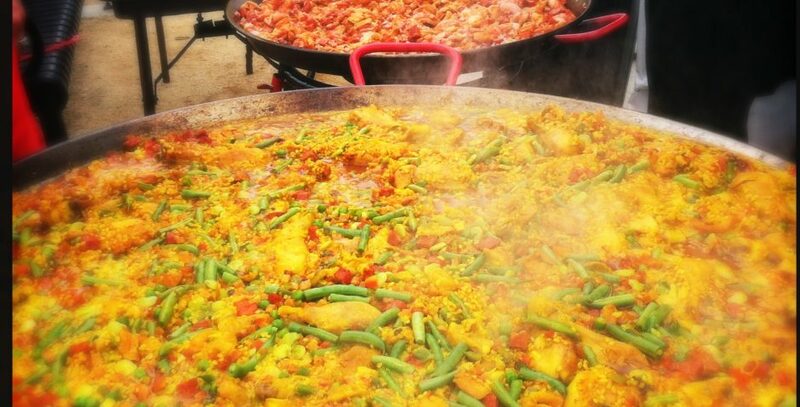 It’s not paella valenciana you’d find in Valencia with rabbit and broad beans. 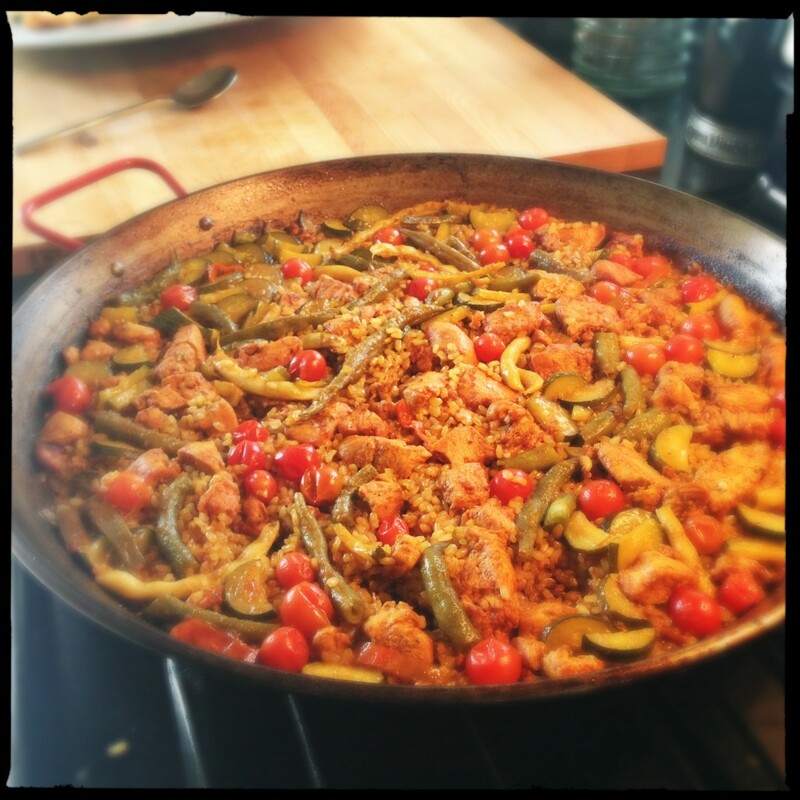 It’s not your mother or your father’s paella. It was a more like a “this is what I have in the fridge and garden right now” type of paella. So by that measure, it’s a paella. And it should keep me eating for a while this week. Bringing the broth up to a boil. This is going to be good! I had yellow and green beans, some cherry tomatoes, and my first two zucchini of the year sitting on the counter, waiting to be eaten. After watching a PBS series (“Spain…On the Road again) that I had rented on my new AppleTV, in specific the episode on Valencia and paella, I was a little inspired. Ok, let’s be real – I just had a craving. Combine that with some organic short grain brown rice from Costco I had picked up the other week that is supposed to be good for paella, it was a fait accompli that I’d be making a paella. Ok, so I didn’t have the wood burning fire out in Albufera Spain, where the bomba rice comes from but I had a paella pan and I was going to cook! Side geek note: bomba rice is famous for being able to absorb 3-4 times it volume in liquid thus taking in your flavors of the broth. The rice is the thing, with what you use to flavor the broth just acting as supporting characters. I will also tell you I had a type of sofrito already ready in the freezer. The last big paella go, I had left over sweet bell peppers and onion and made somewhat of an pepper onion soup with saffron and broth in it. After I cooked some chicken breast (thighs would have been better, but again what I had in the kitchen was breast meat) that had been marinated in garlic, smoked paprika, and olive oil, I put the thawed sofrito in the center and cooked it down with some grated tomato. After it cooked down to a dark red, I added the veggies and filled the pan with organic chicken broth. When it came to a boil, I tasted for seasoning and adjusted with salt and cracked pepper. Then I sprinkled in 400 g of the short grain brown rice and brought it to a rapid boil. After the liquid cooked down, I could hear the crackling which meant the socarrat (the lovely carmelized crust on the bottom) was forming. When that happened for a few minutes, I turned the heat off and covered it to let it rest for 10 minutes. I didn’t have peas in it. I didn’t have fancy piquillo pepper garnish. I didn’t have parsley…but it didn’t matter. 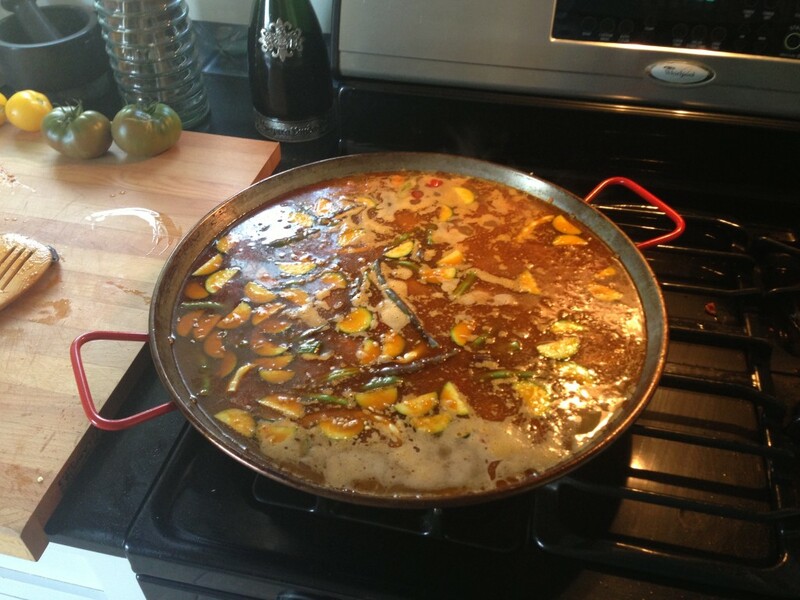 The result was still delish and was definitely work calling paella(esque).